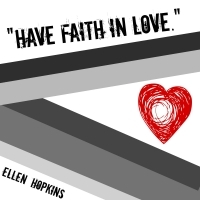 After devouring Rumble, I remembered why Ellen Hopkins' books helped me through high school. I've been in love with her work ever since I read Crank for the first time. And not only is she an amazing author, but she's also one of the most humble and phenomenal people I've ever had the pleasure to meet. I've gone to a few of her signings at the Teen Book Festival in Rochester, NY and had a chance to talk to her. She's just as sincere in person as she is on the page. Her latest work among ten YA titles and two adult novels, sheds light on what it means to struggle with faith, but also deals with issues such as identity, guilt, forgiveness, book censorship, and bullying, just to name a few. What emerges is a tumultuous tale that follows Matt Turner in the wake of his younger brother's suicide. Ridiculed for being gay, Matt's brother, Luke, took his own life and the lives of the people he left behind are explored within this book. As Matt struggles with his brother's death, he also begins to understand what it means to be human and to be alive. As always, Hopkins' poetic prose drew me in from the first page: "in the narrow pewter space between the gray of consciousness and the obsidian where dreams ebb and flow, there is a wishbone window. And trapped in its glass, a single silver shard of enlightenment." If the beauty of the words themselves weren't enough, this opening paragraph hit me head on. It is this idea of the gray space between that emerges as the story goes on. It's not the BIG theme, I suppose, but for me, every action and reaction in this novel seemed to deal with black and white thinking and what can happen when we start to look at the gray between. There were moments in this book that made me laugh and others that broke my heart. Ellen Hopkins has a way of digging right through a reader's rib cage to find the heart and release into us the pain of other people we've never met. I will never forget this story nor the understanding it has given me. In discussing subjects that are often "taboo", Hopkins sheds light on stories that may never have been told otherwise. And in discussing book censorship, a hot topic that is very much linked to her own work, she explains it perfectly. The book being pursued for banning in her story is The Perks of Being a Wallflower, which also happens to be one of my favorite books. She explains that "some young people have no one to speak for them. Charlie does." I agree wholeheartedly and I think I would amend that statement to say that Matt does and every other character Hopkins has brought to life as well. They all speak for people that might never have had a voice and they speak to the people who need them most. They change lives. I can say this with complete certainty because books saved me as a younger adult and I know how powerful they can be. One of my favorite quotes from the book says that "perspective is an amazing thing. Sometimes it takes distance to find it." I think she speaks to Luke here, a character and an example of too many teens who choose to end their lives. It's easy to say it gets better, but it's more difficult to show that. But perspective is something we don't really understand until after the fact and I think knowing that some day, some distance away that you will understand why things had to happen is important for anyone struggling. In the end, I think the way Hopkins handles the difficult issues in the novel says to readers that it's okay to struggle, to be conflicted with their faith, to wonder about the world. As long as they "have faith in love," everything will be okay. This is great and so is this book! I hope you will all consider reading Rumble and sharing it with those closest to you!